Update: The quiz is now over. 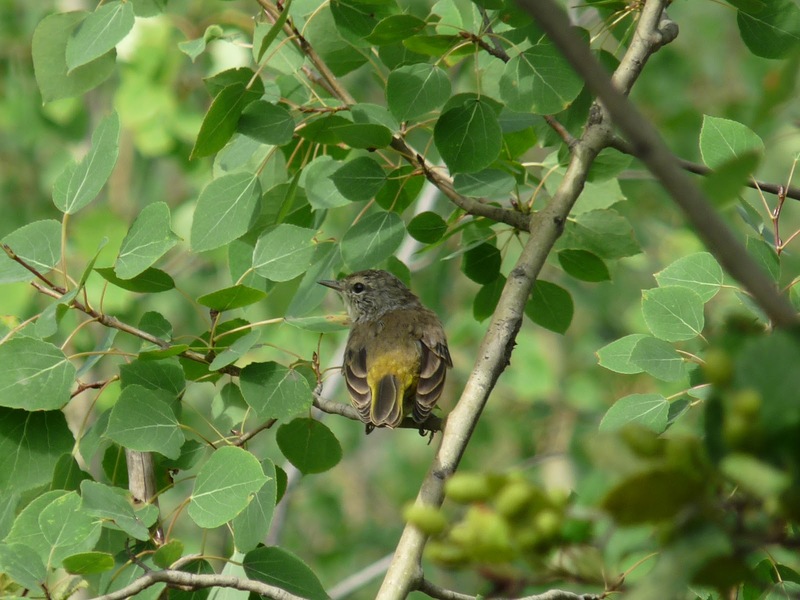 The mystery bird is a juvenile Palm Warbler (Setophaga palmarum). The greyish head and pseudo-spectacles likely threw off most that chanced a guess. I will add a different view of the bird that shows the chest of the bird, which gives it a stronger likeness to Palm Warbler as West Coasters know them. The feature that helps the most (in my opinion) in pointing toward this being a Palm Warbler is the olive-brown back that strongly contrasts the dark yellow rump. Thanks to all that participated! The lightly streaked chest is a field mark that probably would have pointed a little too strongly to Palm Warbler to make this a good quiz bird shot. I took a photo today and thought it would make a great quiz bird shot. I think it would be sad to have only a few votes in a poll, so I'll just leave this one open as a quiz to anyone who cares to take a stab at it. I think it's a little tricky, so I'm hoping some of you will not feel shy and take a guess either in private or in the comments section. Heck, if you're feeling up to the challenge you can also try to guess the age too! Who am I? We now know it's a Palm Warbler! Put your thinking caps on, dust off your Golden Guide and flip to the fall warblers page, and share what you come up with for an identification. Haven't checked my guide yet, but could it be a immature Connetticut or something, similar? I wish! 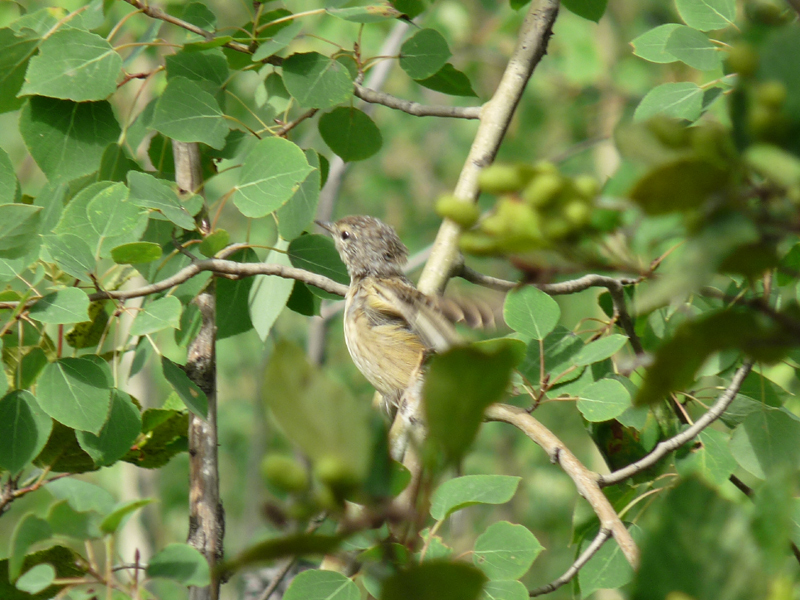 Aside from being a warbler with the greyish-headed, yellowish-bodied look, the mystery bird is in a different genus (which is not surprising because the genus Oporornis, which contains Connecticut, now has only a couple species). The structure of the bill and body would be different and there would be a much more prominent eyering if it was a Connecticut. I appreciate the guess - not even certain Jeremys will guess. Luckily there are so many Jeremys in the birding community that Jeremy Kimm's identity is safe. The lack of prominent eyering may make my guess null and void, but that bright rump has me thinking Nashville..? That rump is a feature that helps, but it's not a Nashville! Indeed I suspect a proper eyering would be seen on a Nashville and it would have a cleaner, more well-defined hood. Thanks for the guess! This is exceptionally tricky and when I looked at the shot on the screen I immediately knew it was destined to be a quiz shot. Alrighty, how about Cape May? This is a really nice series of posts you've got here Jeremy. Great stuff. I knew it was hard, but I didn't know it was Ian Cruickshank-stumping hard!!! So am I allowed to guess??? No... I gave you infinity guesses behind the scenes and on your eighth guess you FINALLY got it! Third guess! My Pink-footed Shearwater guess doesn't count. It's just been so long since I have seen a ahearwater here in Vic, I momentarily forgot what they looked like! Guess #2: Why isn't this just an Orange-crown, maybe a nice gray-headed orestera if you were up in their neck of the woods. The pattern around the eye looks like a good match and the bill looks fine. The bright-looking rump and the bold edging on those tertials kinda had me questioning Orange-crown, and you know, I really did expect you to be quizzing us on something a little more exciting than an Orange-crown. Something like a Cape May. Jeremy K's really guess tally is four, so you can tie him if you get it on your next - yeah, it's that tricky! I didn't literally mean to use the Golden Guide! Just kidding - but we're still looking for the answer! It's time for a hint: the behaviour made this one easy to identify. That's not a huge hint, but it's a hint. So don't tell me the tail was going up and down, and it's actually a Palm after all? It sure doesn't have much of a face pattern yet if it is. Now I'm thinking maybe, just maybe I'm seeing the tiniest trace of rusty coming in in those crown feathers? Well, this makes the 7th warbler species suggested so far! A bit pathetic maybe, but fun, so keep the toughies coming, Jeremy! Pretty funky for a Palm Warbler, isn't it? You don't really think of them having that greyish head, but there you have it. Other features start to make sense once you know what it is - the back colour is a good one for me. That olive-brown is pretty unusual. Wow, the cheap shots keep rolling! Stay tuned for my next blog post, entitled "Violated in Victoria"! Is it a guilt piece about that time you put your hand on my leg? The Birds of my Brazilian Highlands? Wow, there goes the line....... I want a chaperone next time we do a Big Day!